Parish Pastoral plan of the Archdiocese of Kolkata on this day. On this day, the parish community gathered half hour ahead of the usual Sunday Mass timingat the main entrance of the chapel. The celebration kicked off with a very solemn procession, complying with the general instructions of the Archdiocese, with the banners that were provided. A representative from each cell was carrying the banner signifying their role of standing with the cell for its growth and fruition in the life of the faithful of our parish. Like the people of Israel triumphantly entering Jericho, we entered the chapel with great solemnity holding high those beautiful and capturing banners. We had singing and beating up of drums with few adivasi and Bengali hymns of praise as we entered the chapel. Upon entering the chapel the banner bearers held high the banners in front of the Altar facing the assembly till everybody was in and the celebrant was at the Altar. Followed by that the banners were placed on the decorated pews at both sides of the isles in front of the Altar facing the congregation. The significance of the day was heightened by the presence of Rev. Fr. Arockia Swami, the principal of Morning Star College who presided over the Mass. In his homily he, very briefly, touched upon all the cells of the Parish Pastoral Plan. He encouraged the faithful to be participative in building up the church contrasting the older notion that the work of a devout Christian is to “pay, pray and obey’. He also appreciated the initiative of the Archdiocese’s attempt to involve the lay faithful in running up of the church and their empowerment to a great extent. As per the instruction we had composed the prayer of the faithful for each cell and sought help from the Almighty Father for the success of this endeavour under taken by the Archdiocese. The Mass was over around 10:00 a.m. As the parishioners were leaving the church we distributed the brochures and encouraged them to go throw them and deepen their understanding of the meaning and intentions of these cells. So that, one could be an active participant and contributor towards the success of the Parish Pastoral Plan. The Parish has established twelve cells for each of the concerns. The parish also has planned several animation programmes with the cells to animate the process of parish pastoral plan. The Inauguration of the Pastoral Plan at Queen of Peace Church, 9 August, 2015 was a grace-filled day for our Parish. The enthusiastic Parishioners gathered around the altar for the inauguration of the Pastoral Plan. Here below we are giving a blow-by- blow presentation of the same. 1. 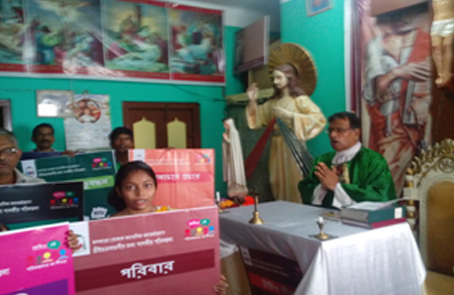 The commentators of Bengali and English Masses respectively give a brief description of the Pastoral Plan and invite people to be actively involved in the same to make the Parish a vibrant Christian Community. 2. 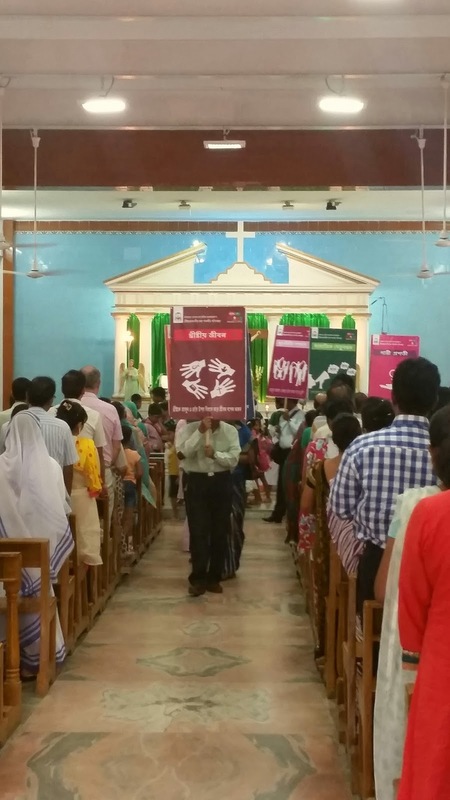 The Banners of each concern of the Pastoral Plan are being carried in procession to the altar by the Parishioners along with one each candle, to be placed in front of each CONCERN. 3. The Banners are planted in earthen vases facing the Parishioners for their perusal and understanding of the same. 4. After the homily the Parishioners inaugurate the Pastoral Plan by lighting the candle placed in front of each Pastoral concern banner. 5. 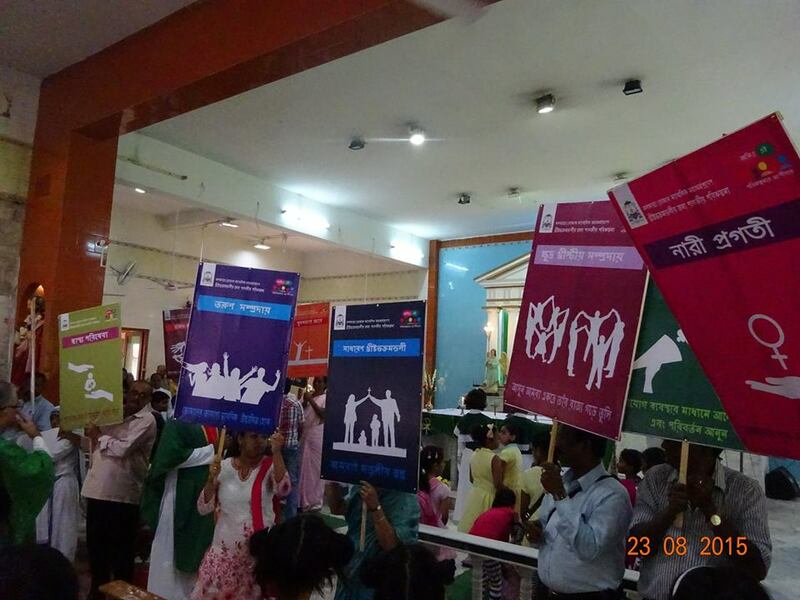 After the Mass the banners are being taken in procession to the hall for exhibition and interaction. 6. The interaction of the concern-cell with the Parishioners interested in join any concern of their choice is being discussed. The Inauguration took place during 8:00 a.m. and 5:0 p.m. Masses, 09.08.2015. Special prayers were offered, for God’s blessings, for the fruitful implementation of the Pastoral Plan. During the 8:00 a.m. Mass Fr. Patrick Eaton, SJ gave an inspiring sermon explaining the meaning and purpose of the Pastoral Plan. During both Masses the flexes, supplied by the Archbishop’s House, were carried by the faithful to the altar as part of the offertory procession; symbolically offering all our efforts to the Lord as they were being placed in front of the altar. During the evening Mass, after communion, Mr. Dilip Gomes explained the Pastoral Plan to the faithful. They were also shown the video in which our Archbishop, Rev. 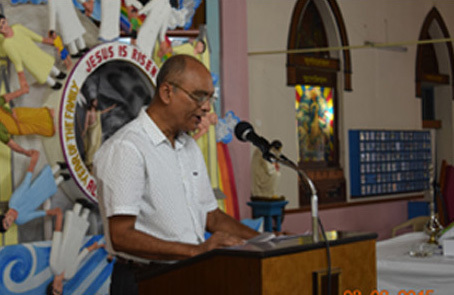 Thomas D’Souza, speaks about the necessity of implementing the Pastoral Plan. After Mass, both in the morning and evening, the faithful gathered in the Parish Hall where the flexes were displayed in different booths. They filled up the slips, given to them along with the handouts, indicating the commission to which they wished to be added and submitted them. It was a beautiful occasion for the faithful, young and old, to share and dialogue with one another their common concerns which, in turn, enabled them to make a spontaneous discernment before they decided and chose the commissions of which they wanted to be members. The program ended with tea and snacks which, once again, provided an opportunity to the faithful to spend moments of joy and cordial relationship with one another. 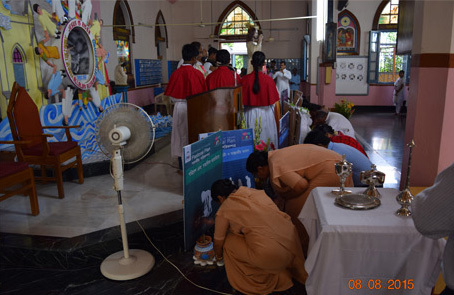 On 23rd of August 2015, St.Patrick’s Church, Dum Dum solemnly celebrated the inaugural mass to initiate and invigorate the Twelve Commissions of the parish pastoral plan. This remarkable occasion began with a procession which was led by our parish priest Fr. J Harmel D’Souza and ended at the altar. 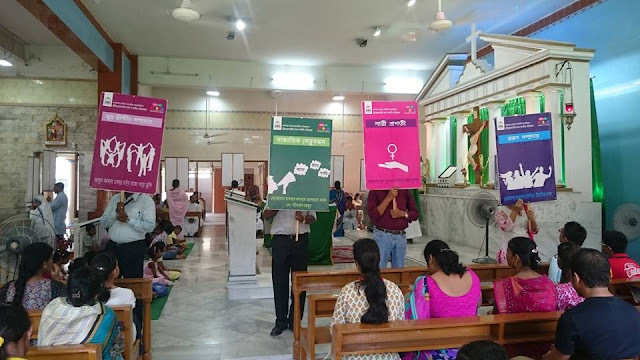 Banners which were held up and carried forward by the twelve members of the parish pastoral council prominently displayed the twelve concerns. During the mass our parish priest very lucidly elaborated on the pastoral plan and all the concerns in English which was eventually being translated in Bengali by our curate Fr. Arajit Bar. After two years of groundwork and prayerful deliberation by the Archdiocesan Pastoral Core Team, the plan was drawn up on the twelve concerns namely, Christian Life, Ecumenism and Inter- Religious Dialogue, Environment and Social Justice, Evangelization, Education, Family, Healthcare, Laity, Small Christian Communities, Social Communications, Women, Youth. Father urged and encouraged all the parishioners to actively participate and involve themselves in any of the commissions for the successful implementation and proper functioning of the plan. The parishioners and the youth showed great interest in forming various commissions and participating in various activities. At the end of the mass, the procession led all the interested parishioners and youth to the Community Centre for filling up the pastoral leaflets provided to them. This grand inauguration was successfully accomplished due to the efforts of the Parish Priests, the council members and the youth. Christ’s mission will not progress unless the parishioners who are the stakeholders of the church step forward and fulfill the key priorities and goals of the plan. So we all pledge to continue our journey as a united Christian community to make our church more vibrant.